The official Bandai B-Boys website has jut updated with it’s October offerings, and that means it’s time for a brand new official image dump! First up on the list is the DX Gekiatsu Dai-Oh from Shuriken Sentai Ninninger! 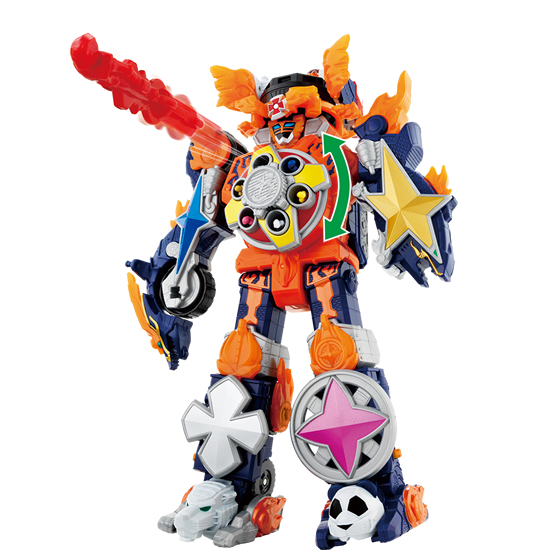 DX Gekiatsu Dai-Oh is a brand new 6-piece mecha formed by all 6 Ninningers. The epitome of Takaharu getting “fired up” this set offers a new uniform color scheme not typically present in combiners of this nature, and is unified by flame detailing. DX Gekiatsu Dai-Oh will be released on October 10th!